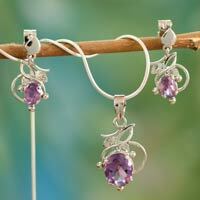 Clinging to sterling tendrils, wisteria blooms as faceted amethysts. Associated with increased meditation, spiritual awareness, and inner peace, amethyst is thought to foster healing and positive transformation. Alok Jain presents the delicate pendant on a silver cord. Matching earrings complete the ensemble.